The Sigma Controls Model 200 is a single point corrosion resistant level probe designed for applications whose distance would preclude using solid rod electrodes such as water wells, pits and tanks. 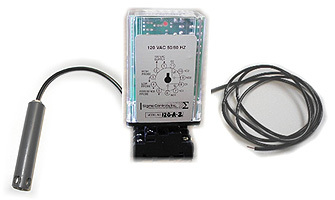 When used with Sigma Controls Model 1000 solid state conductance level control relays, these probes form a complete integrated level control system for single point (alarm) or dual point (pump control) applications. The conductor is manufactured from 316 stainless steel and is provided with a PVC protective shield to prevent accidental operation when used in metallic tanks or wells with steel casings. Overall dimensions are 3.75” long by .78” diameter. All wire mounting hardware is 316SS. Sigma 200-SW single conductor suspension wire is specially designed for use with these probes to provide maximum insulation and strength.